"And there came one that had escaped, and told Abram the Hebrew; for he dwelt in the plain of Mamre the Amorite, brother of Eshhcol, and brother of Aner: and these were confederate with Abram." Controversy centers around the word "Hebrew" in this passage, and the discovery of the word, "Habiru" in numerous ancient sources. Initially, Biblical scholars were quick to point out the striking similarities between these people and the Hebrews of the Old Testament. Over 200 references to these people have been found throughout the whole of Ancient Near East literature. Such references have shed further light on the Habiru. One of the leading experts on the Ancient Near East, Nadav Na'aman, points out the "dimorphic" nature of Canaanite society. One aspect of ancient society was composed of urban elements. These people lived in settled areas, living in urban centers, whether they be villages, towns, or large metropolitan centers. Ancient Sumerian Sources : The earliest known references occur in ancient Sumerian cuneiform tablets. The ancient Sumerians were the first civilization in recorded history, and possess mysterious origins. Ancient Egyptian Literature : Ancient Egyptian literature dealt with these people, calling them the Apiru. The Hebrew/Apiru connection is especially interesting in Egyptian literature, including the below Amarna Letters. The Amarna Letters : The initial discovery of the Habiru surfaced with the discovery of the Amarna Letters in Egypt. This collection is the most extensive treatment of these people from ancient sources. These letters depict the land of Canaan in a state of upheaval. The Akkadians : In the ancient kingdom of Mari, over 25,000 Akkadian tablets were discovered. These tablets provided place names for over 500 previously unknown places. The Mari tablets shed invaluable light on the identity of the Apiru as well. The Ancient Hurrians : Nuzi was a Hurrian city in the kingdom of Arrapha. In this agricultural city, over 5,000 tablets were discovered. These tablets mention these people being forced to enter domestic service. The Ugarit Texts : The Ugarit discovery proved to be one of the single most important archaeological finds in the modern era. Texts from an ancient scroll school and library led to the decipherment of Ugaritic. These texts also mention the Apiru, a different appellation for this group of people. The Ancient Hebrews : Fundamental to the connection between Habiru and Hebrew is the origin of the ancient Hebrews in the Bible. The book of Genesis credits Eber as being the father of the Hebrews. The second element of society was the tribal element. The Tribe was common to all the Ancient Near East civilizations. It was so intensely ingrained in the psyche of the ancient world, that attempts to eliminate the word from modern academic usage have failed. The tribes of the ancient Near East were much more than just large families. It was a diverse entity. Tribes were made up of a number of different families and individuals, from a diverse background; farmers, nomads, and those living in metropolitan areas. Tribes were more defined by geographical regions, and territories, than by social position, or blood. Small towns, metropolitan cities, villages, and nomads often made up the large and diverse areas of certain tribes. Tribes served to unite diverse families and members of society, from all stratas. The tribe was the social, religious, political, and military backbone of Canaanite society. 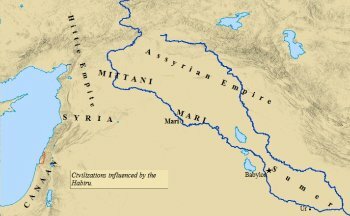 The Habiru culture stretched across the Fertile Crescent - from the Mediterranean Sea to the Persian Gulf, and southward into Egypt. Consequently, it was comprised from both sectors of society, the urban and the tribal. Times were also often violent, and dangerous. Canaan was caught in the crossfires of Mesopotamian powers in the East, and the great power of Egypt in the South. Local wars were fought between individual city-state kingdoms. Villages were often raided by nearby bandits and outlaws. The tribe, thus, was a critical element of protection and stability as well. Yet they weren't immune from disaster. Catastrophes could result from a wide variety of factors, including debt, excessive taxation, famine, fire, war, etc. Such occurrences could often leave tribes severely weakened, if not completely disbanded and destroyed. The weaker elements within a tribe were sometimes unable to survive such a disaster. The families, or members, who possessed the least amount of livestock and land, the poorest members, were often forced to abandon their tribe, and homeland, and seek out an existence in neighboring countries. These ancient immigrants and exiles would often meet up with other exiles, and in turn, form their own band. These bands operated independently out of necessity. They had no homeland, no central political entity. Their social structure had been radically altered. They were forced to seek their identity within their new tribe, abandoning their cultural customs, or merging them with other cultures found within the tribe. Within these new tribes, which were limited in number, an especially capable, or popular, individual would emerge as its leader. These exiled bands became a transitional social element, not urban, nor nomadic, in nature. In fact, these bands were made up primarily of members from sedentary populations. However, both sectors of ancient society, the urban and the tribal, were vulnerable to being exiled from their homes, thus, both sectors were discernible in these new tribes. Na'aman argues that the very nature of these tribes led to their means of survival. They were the weaker elements within their native tribes. "In tribal society the most predatory elements were usually the small and poor tribes, or splinter groups. These lacked the strength to assert their claim to pasture. As a result they would turn to brigandage." These new tribes became known in the ancient world as The Habiru. CLICK HERE TO SHARE YOUR THOUGHTS. Who do you think these people were? Why were they so widespread? What could the connection be between them and the Hebrews? Give us your insights, thoughts, questions, and comments! Nadav Na'aman is one of the leading experts in the world concerning the ancient history of Israel. This article appeared in The Journal of the American Oriental Society, published by American Oriental Society on October 1, 2000. In it, Na'aman discusses these people in great detail, and sheds invaluable light on the makeup and structure of their tribes. He also relates this group to the Hebrews in the Old Testament, and discusses several similarities. This is a very insightful and scholarly article. Click on the link below to re-direct to Amazon.com to view Habiru-like Bands in the Assyrian Empire and Bands in Biblical Historiography.